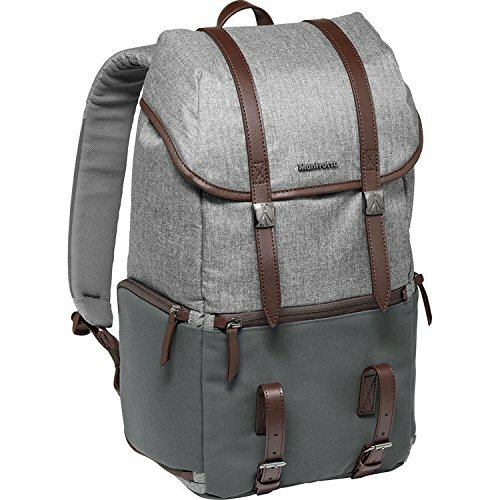 With vintage styling, genuine, brown leather accents and a handsome Tartan lining, the gray Windsor Camera and Laptop Backpack for DSLR from Manfrotto is designed to store, protect, and transport your gear in luxury. The pack features a removable, padded insert with touch-fastening dividers for organizing a DSLR with an attached 70-200mm f/2.8 lens, 1-2 extra lenses, and related accessories. Access camera equipment from the side, and personal items from the top. Interior and exterior pockets are useful for storing a wide variety of accessories. For weather protection the pack has a large top flap with drawstring closure underneath. Inside the top of the pack is a padded, dedicated compartment for your 15" laptop or tablet. Use the Windsor as a camera or everyday pack. Carry the pack with the top strap or wear with the adjustable, padded shoulder straps. The back panel is padded to cushion impact and improve airflow. Easily attach your tripod thanks to two adjustable, genuine leather, exterior, front straps. For strength and durability the pack is constructed with water-repellent nylon and synthetic fabrics.